Walking with Jesus: Day 91: Acts 28:23-31 & Prov. 29:10-18 - Why Does the Book of Acts End the Way It Does? Day 91: Acts 28:23-31 & Prov. 29:10-18 - Why Does the Book of Acts End the Way It Does? 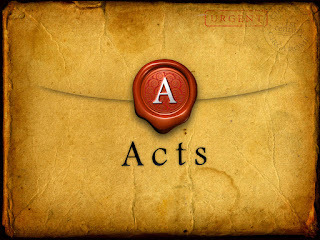 Why Does the Book of Acts End the Way It Does? The book of Acts ends in a way that leaves many people scratching their heads. The ending seems abrupt and somewhat unresolved. Paul is under house arrest in Rome. He is neither set free nor is he executed, although both would happen to Paul after the ending of Acts, So, why end the book with such an apparently unresolved and un-final ending? 2. Luke is emphasizing the fact that the Gospel remains always unhindered. Though Paul is in chains, kept under house arrest and chained to a guard, he is able to preach the Gospel "with all boldness and without hindrance." 4. The open-ended nature of the book is an indication that the story of the Gospel's unhindered advance continues. It is an invitation to see the Gospel continue to advance, unhindered, to all the nations. So, upon closer consideration, we can see that the ending of Acts is not abrupt or incomplete, but it is perfectly crafted to bring this marvelous book to an open close, an intentionally unresolved resolution. Heavenly Father, we thank You for the Gospel and for the blessings of the kingdom of Your Son. May we be as bold as Paul and proclaim the Gospel unhindered by whatever opposition we may face in this world. In Jesus' name, Amen. Father, we live in a world of violence and foolishness. Lord, give our leaders wisdom and good counsel. May they be guided by truth and not by lies. Give our leaders and commitment to faithfully judge the poor. We know that our King Jesus always judges justly and always does what is right. Give us more of the wisdom of Christ in our land, in our homes and in our lives. In Jesus' name, Amen.